The retail industry today is a $22 trillion market worldwide. At approximately 7% of the total, online retail is still in its infancy. There is huge growth opportunity ahead for omnichannel and online retail and this growth will come at the expense of less effective traditional models. Just look at what’s happened in the $300 billion+ advertising industry. Look at the spending growth in digital advertising at the expense of the shrinking budgets of traditional media such as print and radio. The same is starting to happen with online retail. 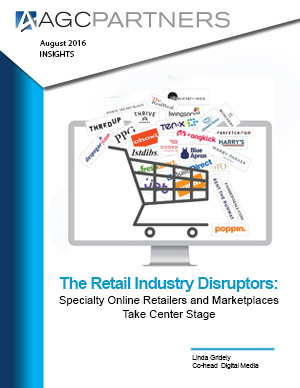 New online retail companies are bringing massive disruption to the retail industry. They are able to build more efficient and effective business models from scratch and are not inhibited by outdated cultures and technologies. They embrace the fickle, price sensitive, more informed, mobile customer and strive to figure out how to satisfy him/her. Use of data, technology, and constant innovative thinking are often the key success drivers for these new companies. Finally, they are even starting to “beat the traditional retailers at their own game” by opening up highly successful brick and mortar stores to create the flexible, omnichannel shopping experience that consumers are looking for. Meanwhile, traditional retailers are “stuck” having to manage their way through oversized physical stores, use of replacement of outdated technologies, and traditional (and often inflexible) business models and personnel. As for the consumer, they are increasingly taking control of their shopping experiences. They are proactively deciding where to shop, how they want to shop, and what they want to buy. They are doing their own research before, during, and after their purchases and are more influenced by what their peers say than by what any “push” advertising has to say. Finally, they are creating their own paths to purchase and seamlessly moving across buying channels. Millennials are leading the charge to take more control of the shopping experience. It’s against the backdrop of all this activity that we decided to put together this report. Our goal was to lay out the key trends and capabilities driving the successful emergence of specialty online retailers; define the relevant private company universe; and highlight the major M&A deals, private placements, and VC/PE investors.